Top US leaders and other global officials at the Warsaw summit on Middle East security — which was mainly about thwarting Iran — on February 13, 2019. A US-led conference in Warsaw this week that was intended to isolate Iran has ended up isolating America instead — highlighting one of the central problems of President Donald Trump’s foreign policy. The two-day, hastily organized summit, which ended on Thursday, was billed as a Middle East security conference. But it was an open secret that the gathering of more than 60 countries was really about getting the world on board with America’s tough-on-Iran policy, even though the US denied that was the case. This annoyed European allies, many of whom sent only low-level diplomatic staff — or not representation at all — to attend the meeting. The discord on the issue of Iran dates back most recently to last May, when the US withdrew from the 2015 Iran nuclear deal, and European allies like France and Britain agreed to remain in the accord. Their reason was simple: Although Trump said Iran tried to obtain a nuclear bomb, European nations saw no indication that Tehran sought one. And even though US intelligence agenciesagreed with that assessment, Trump spurned the dealmakers by backing out of the landmark diplomatic pact, reimposing sanctions on Iran, and threatening to penalize anyone who imports its oil. But then it got worse for the Trump administration. Europe worked out a method in January to bring in Iranian energy while avoiding American financial reprimands. 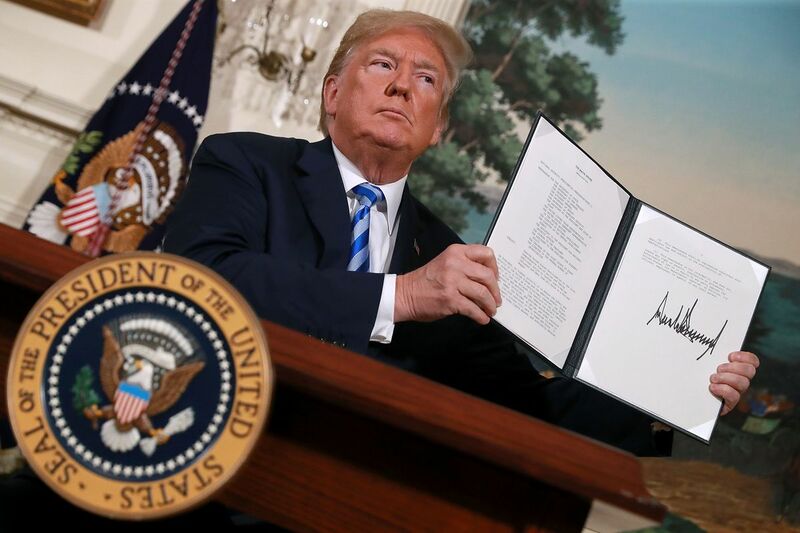 That allowed Europe to keep the nuclear deal on life support while curbing the damage America’s sanctions could wreak on Iran’s economy. Now that the Warsaw conference is over, it’s clear that the meeting has deepened the rift between Europe and America — all because of the Trump administration’s stubborn insistence on the fact that Iran is currently seeking a nuclear weapon. However, he is right to point out that Tehran is doing terrible things, such as propping up Syrian dictator Bashar al-Assad, launching missiles, and supporting terrorists in the region. “Rather than serving as a unifying diplomatic exercise to highlight Iran’s troubling regional activities, the summit primarily highlighted America’s diplomatic isolation from its European allies,” Amanda Sloat, a Europe expert at the Brookings Institution, a think tank in Washington, DC, told me. First, the meeting got off to a bad start. Rudy Giuliani, Trump’s personal lawyer, spoke Wednesday at a nearby rally organized by an anti-Iran group — which was once designed by the US as a terrorist organization — for which he’s been a long-time lobbyist. “Everyone agrees that Iran is the number one state sponsor of terrorism in the world,” Giuliani told USA Today on the sidelines of that meeting. “That has to tell you something: Iran is a country you can’t rely on, do business with, can’t trust.” While Giuliani’s comments didn’t happen at the Warsaw summit itself, it definitely tarnished the thin veneer that the US was in Warsaw to speak ill of Iran. 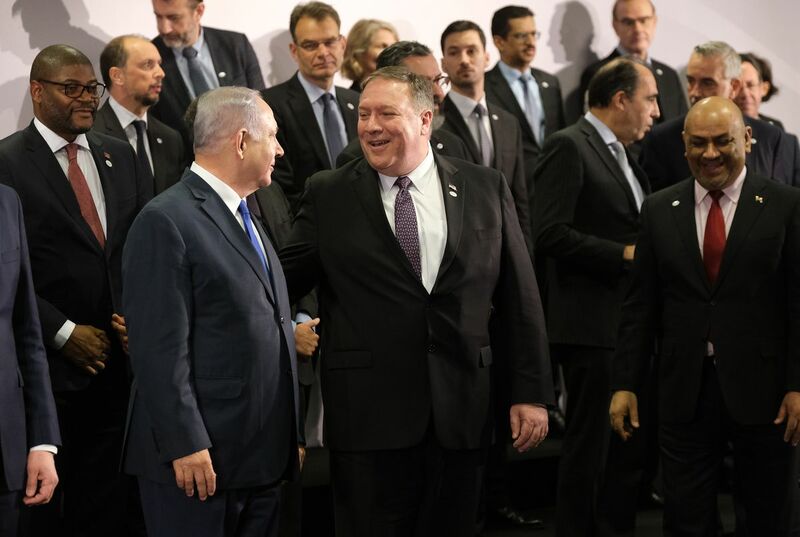 Secretary of State Mike Pompeo and Israeli Prime Minister Benjamin Netanyahu talk during the group photo at the Ministerial to Promote a Future of Peace and Security in the Middle East on February 14, 2019 in Warsaw, Poland. Second, attendance at the official Warsaw meeting was poor. While invited by Brian Hook, the Trump administration’s special envoy for Iran, leaders of Germany, France, and the European Union — all members in the Iran nuclear deal — didn’t come (although UK Foreign Minister Jeremy Hunt did attend). Meanwhile, other European and Arab nations sent low-level delegates to the sessions. That left top American officials, like Vice President Mike Pence and Secretary of State Mike Pompeo, in the lurch. Usually they would only attend events featuring their counterparts. But in this case, they flew all the way to Poland to hobnob with foreign leaders well below their stature. Third, even high-level foreign officials who did attend made news for all the wrong reasons. Benjamin Netanyahu, Israel’s prime minister, blundered on Wednesday when his official Twitter account not only described the true purpose of the meeting, but also accidentally declared war on Iran. “What is important about this meeting, and it is not in secret … is that this is an open meeting with representatives of leading Arab countries, that are sitting down together with Israel in order to advance the common interest of war with Iran,” the tweet read. The tweet was deleted an hour later, but the damage was done. Apparently it was a bad translation of the Hebrew word for war; Netanyahu meant “combating.” A new tweet using that word instead of “war” soon went up on the prime minister’s account — perhaps to make sure no one saw war in Warsaw. And finally, Pence did himself no favors by using his speech to openly lambast America’s European friends. “They call this scheme a ‘Special Purpose Vehicle,’’ Pence said on Thursday, referring to the mechanism Europe uses to still trade with Iran. “We call it an ill-advised step that will only strengthen Iran, weaken the EU, and create still more distance between Europe and America.” His address amounted to a call for Europe to give up its plans to follow America’s instead. But Pence’s demand was the ill-advised move. Asking Europe to do something it clearly doesn’t want to do — like cut economic ties with Tehran and scuttle the Iran deal — will only damage fragile US-European relations. What’s more, it will make the Trump administration look weak, especially if those nations don’t listen to America. “The US further widened the divide with its allies at a forum that could have been used to heal some of the wounds,” says Eric Brewer, an Iran expert at the Center for a New American Security think tank in Washington. It’d be one thing to do all this damage if Iran actually was pursuing a nuclear weapon in direct defiance of the nuclear deal. The problem is, even US spies say Iran is abiding by the accord — which means all of the self-inflicted pain in Warsaw was for nothing. President Donald Trump withdraws the United States from the 2015 Iran nuclear deal on May 8, 2018, in Washington, DC. The Warsaw conference was surely meant to help rectify that. It did anything but.